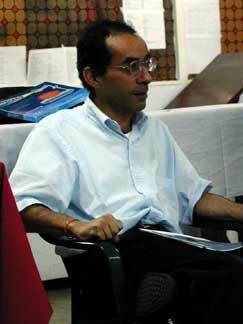 In August 2002 the Witness for Peace/SOAW POC Colombian Delegation spent time in Bogota, the capitol of Colombia. At 8,500 feet it is situated high in the Andes Mountains. 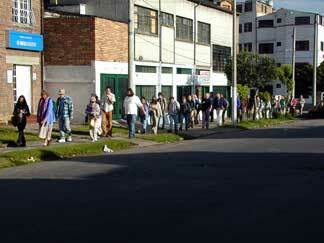 An urdan center of nearly 8 million people, (the size of Chicago), Bogota faces the same problems as many large cities. The main exception is the large number of displaced citizens due to fumigation and conflict. We visited with union organizers; church people; economists; college professors; a torture survivor from a School of the Americas graduate; United States Embassy staff; and others. We heard the Colombians' stories of regional and federal social programs along with their stories of obstacles and pain. We heard over and over how fumigation and the military aid of "Plan Colombia" is destroying their lives and land (with the exception of Embassy staff). These strong and dedicated people had other ideas of how to create a "Plan of Life" but the people in power, the ones with the "guns" don't listen to the people whose lives are affected. 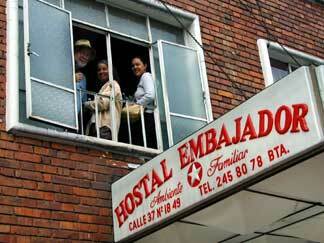 Hostal Embajador, the delegates' home in Bogota. Pictured above in the second floor window are POCs Steve Jacobs and Mary Trotochaud with WFP staff person Roxanne Hanson. 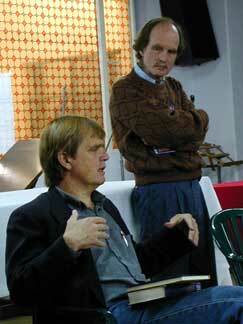 Peter Stuckey (seated), pastor, Mennonite Church in Bogota with his brother Paul Stuckey, director, JUSTAPAZ. Most of the meetings were held in their church space. 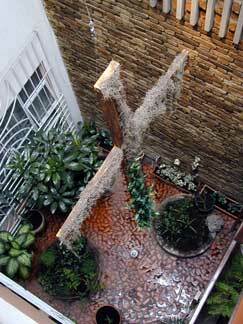 The cross hanging in the entry of the Mennonite Church. 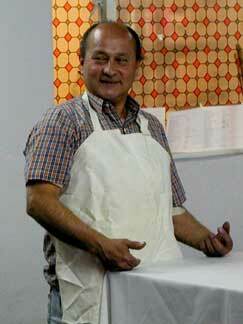 Don Hernandoe prepared all of our delicious meals in Bogota. 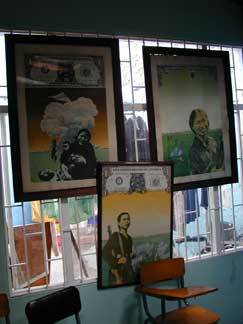 These three posters were hanging in the Sinaltrainal Union office. They depict three stages of the "American War" in Vietnam. As the dollar bill at the top is chipped away, the people become free. 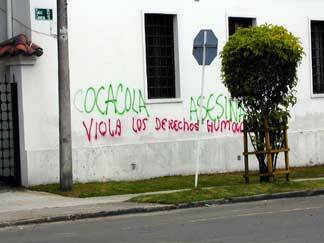 On the street - "Coca-Cola Assassinates". 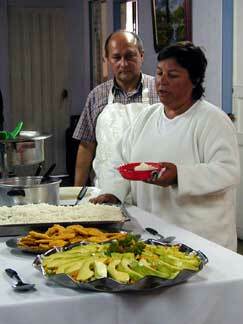 WFP Great Lakes Regional Director Kathy Baldoni admires our meal. 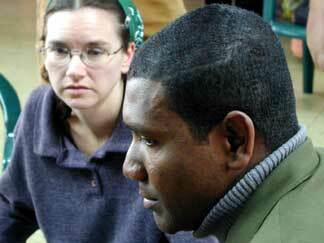 Barbara Howe above and Megan Kennedy below, WFP delegation members, listen to the stories of re-insertas. These are individuals who have left either a para-military or guerrilla group. The stories included telling of the Colombian governments promised - but not provided - support. (read more - click here >> soon). 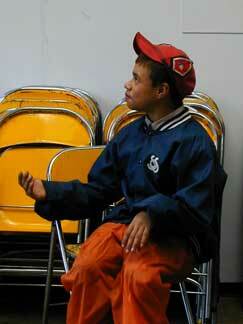 Leonard, a street kid who visited us. Our main mode of transportation while in Bogota. Being a "part of the street" was a great experience. IMAGES ©MMII CircleVision.org. All rights reserved.